In case you missed it, the fifth round of the FSC Book Club is up and running! We are reading Molly Wizenberg's new book Delancy: A Man, a Woman, a Restaurant, a Marriage. You may know Molly from her blog Orangette or her first book, A Homemade Life: Stories and Recipes from My Kitchen Table. It's a little bit memoir, a little bit cookbook and the perfect late summer/early fall read. Learn more about the book club, our reading schedule & how to join here. Remember, it's a low-stress, laid back, online club and it's free. No excuse not to tag along! 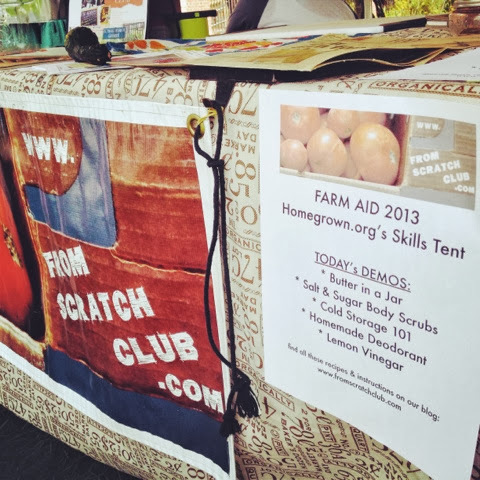 Last weekend I tabled with From Scratch Club as we co-presented the Homegrown Village Skills Tent at FarmAid. I don't even know how I ended up in such an incredible situation. When I look back on the past few years, I look at the facts and I still pinch myself sometimes that I get to meet and know such great people doing so much good in the world of local foods. Through FSC, I've interviewed farmers and cook book authors and regular home cooks for our podcast. 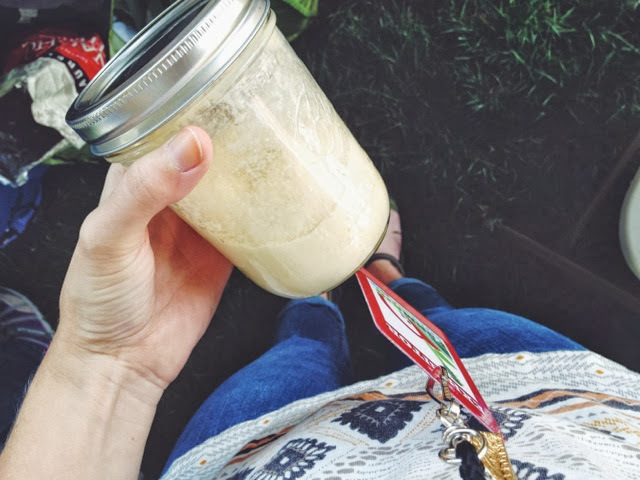 I've met dozens of awesome peeps at our local food swaps. I chat with people throughout the country through our online book club. And now I can say that I've sort of shared billing at FarmAid with the likes of Neil Young and Willie Nelson. All because I like eating, and I like eating well. It's a natural interest, is it not? Everyone eats. Everyone needs food to survive. So why not start to know more about where your food comes from? Find out who grows it and how. Try your hand at cooking, even if it's not your passion. Build your confidence in the kitchen with a few simple recipes- those are often the best ones anyway. Bake a loaf of bread. Put a pot of Sunday Soup on the stove. Learn how to can your own jam or tomato sauce. Dehydrate a tray of hot peppers for the winter. You don't have to be fancy, you just need to start somewhere, when you have the moment. 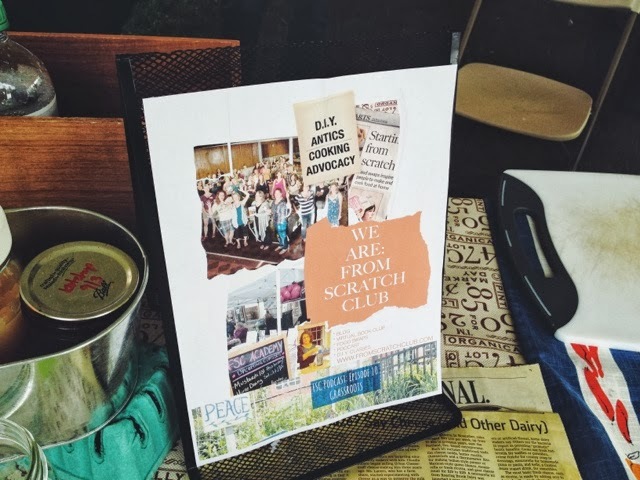 Then on Sunday, From Scratch Club held our September food swap in Troy. Maybe I was just running on adrenaline at that point, but I was blissed out. There were regular swappers who have become dear friends and new, excited faces and I was so so grateful to be among the organizers of this rad food community. Christina and I didn't even bring anything to swap, but we still left with goodies generously given to us by other swappers. They are the kindest and the best and so inspirational. Here's to a great foodie weekend! In between the food love, I also finished the longest run of my life and thus successfully completed the peak training week for my first-ever marathon. If there's anything that makes you appreciate good food even more than usual, it's running twenty-some-odd miles. More about that in the coming weeks. View more photos from the Homegrown Village at Homegrown.org's album or From Scratch Club's Facebook page. More swap photos at the FSC Swappers Facebook page. This Saturday, I will hanging out with Willie Nelson, Neil Young, John Mellencamp, Dave Matthews, Jack Johnson and others. More or less. I'm psyched to be a part of the From Scratch Club contingency that will be showing off our DIY antics at FarmAid! 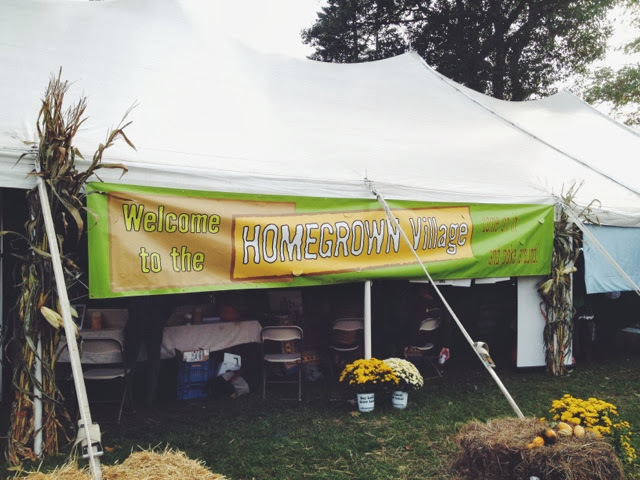 The Homegrown Village Skills Tent is hosting all sorts of demos and workshops on topics ranging from my old standby, making butter in a jar, to growing mushrooms, making bacon or cheese and even making friendship bracelets from llama wool. We're partnering with HOMEGROWN.org, FarmAid's little sibling and the raddest online community for diy-ers, farm folk, urban garden enthusiasts, canning and preservation mavens, earth mamas and all of the wonderful people that make the earth spin. I've contributed over there in the past- maybe you recognize the little icon over there in the sidebar? Check them out! It's going to be wildly DIY, earthy, homegrown, farmer-supportive and fun. If you have tickets to the sold-out FarmAid, stop by and see us! There's a map here showing where the Homegrown Village will be. If you don't have tickets, we won't be able to high five during the day but you can still watch the whole concert on livestream here! Also, there will be Chipotle, Ben & Jerry's and veggie poutine for sale at the festival. Like I said, it's going to be fun. I am in love with the FSC Book Club. The best part is that I don't think I'm alone in that feeling. We are on the third round, cooking our way through Liana Krissoff's Whole Grains for a New Generation, and it's a blast. We "meet" over on Goodreads where people share their tips and advice, ask questions and chat. They post photos on Goodreads, Facebook, Twitter and Instagram. The author has joined in too and is answering questions from our members! I love seeing new comments pop up in the forums and knowing that we are all diving into the world of whole grains together. Amaranth! Quinoa! Oats! Spelt! Farro! It's an awesome challenge and provides a bit of culinary motivation in an otherwise bleak time of year. To be leading a book club and cook-a-long is a dream come true. The Roasted Butternut Squash with Quinoa and Sausage was hands down, the most popular recipe for the quinoa assignment. So many people made it, including two who used homemade seitan sausage! I couldn't resist, so we made it for dinner last night using store-bought veggie sausage and it was fantastic. I knew the FSC Book Club wouldn't steer me wrong.